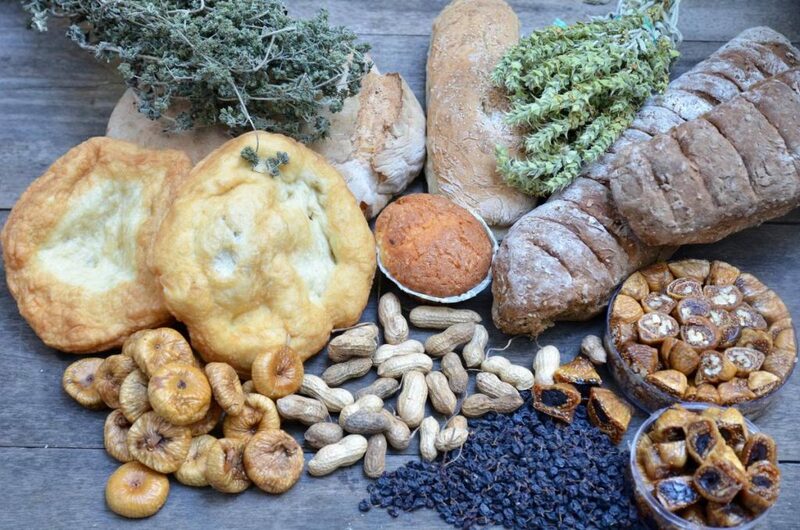 For many people, Messinia is the Promised Land, a bountiful region that produces practically everything. 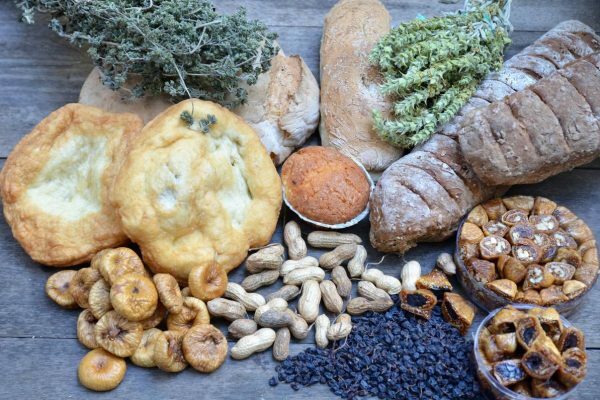 This exceptional agricultural produce naturally forms the basis of its cooking, from its world-renowned olive oil and Kalamon olives to its figs, raisins, citrus fruits, grapes, vegetables, watermelons, prickly pears, peanuts, aromatic herbs of Mt Taygetos and wild greens. The olive oil of Messinia (PDO)- the famous ‘liquid gold’ of Homer – is of such high quality that it ranks among the finest in the world. The vast olive grove of Messinia with the 15.000.000 olive trees, supports about 120 oil presses, which produce on average 50.000-55.000 tonnes of olive oil annually, most of it extra virgin. 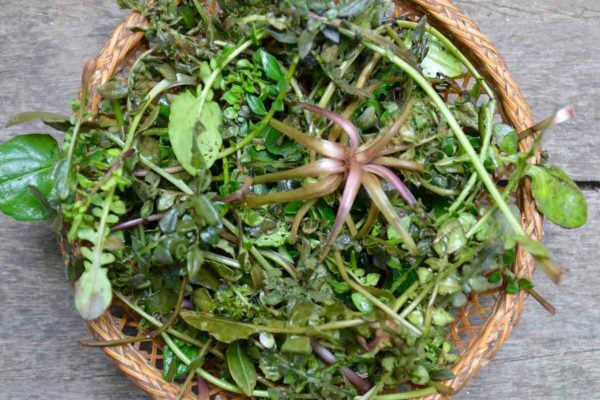 This oil is used in every type of cooking, from salads to pulses, casseroles, frying, even sweets and as a preservative for the area’s cured pork tidbits (synglino). But perhaps the greatest enjoyment of the Messinian olive oil is to be found in this simplest of dishes: a slice of toasted country bread, drizzled with plenty of oil, grated tomato, a pinch of salt from the Mani and some crumbled oregano. Kalamon Olives, Shaped like a tear drop, the olives of Kalamata are famous for their black colour, crisp flesh and fruity taste and they are Messinia’s foremost ambassadors to the world. The area’s exceptional climate conditions combine with careful harvesting to ensure their high quality and singular flavour, something that translates into dynamic exports to the United States, Canada and Australia. Today Messinia produces about 2,500 tonnes of olives per year of various types: cracked green olives with lemon and oregano, black ripe Kalamon, sliced cured in vinegar, and throumbes (sun-dried olives with savoury). An important wine-producing region from ancient times, Messinia is continuing the tradition today with both native grapes – the white Roditis, Fileri and Assyrtiko; the red Fokiano and Mandilaria – as well as foreign varieties. The same vineyards also produce vinegar of outstanding quality. This vinegar not only gives Kalamon olives their distinctive taste but it also lends a special aroma to salad dressings and boiled vegetables. Kalamata is also the home of a unique type of balsamic vinegar, which differs from that of any other because it is made from currants. They give it a special balanced sweet and sour taste and velvety dark colour. It can be thought of as a modern interpretation of a local tradition whereby a kind of vinegar was made in monasteries and homes from grape must molasses (petimezi). It was called monks’ or sweet vinegar, from the sweetish taste that the must gave off as it aged in wooden barrels like wine. The balsamic vinegar of Kalamata is exported widely. Wonderful mustards are made from Messinia’s exceptional olive oils. Messinia is currently witnessing the flourishing of its alcholic beverage industry – liqueurs and distillates made from aromatic herbs and seeds. Its ouzo, raki, brandy are becoming known both on the domestic market and abroad. The history of the raisin goes back three millennia and Messinia remains one of the largest producers and exporters in Greece. For years its cooks have used raisins in their traditional recipes – for stuffed tomatoes, salt cod with tomato sauce, sweets – as well as local breads and biscuits. Although production of currants is nowhere near what it was a couple of centuries ago, it still exceeds 10,000 tonnes per year. Messinia is famous for its figs, locally called tsapelles, which have been cultivated since antiquity. The figs are consumed either fresh or sun dried; the dried ones are packaged sprinkled with sesame seeds and bay leaf or stuffed with walnuts. Whether dried or fresh, Kalamata figs are synonymous with the region and their distinctive taste and high nutritional value make them in great demand at home and abroad. Annual production exceeds 4,000 tonnes, with most exports going to the US, Canada and Europe. Figs are also processed into fig paste, jams, syrup and spoon sweets. 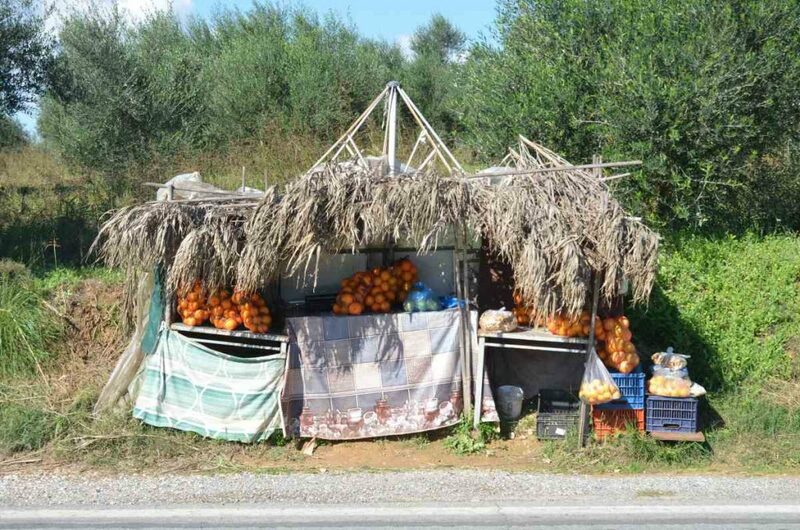 Oranges and other citrus fruits – tangerines, clementines, lemons – thrive in the fertile plain of Messinia, even surpassing the plain of Argos. And they are used widely in cooking. 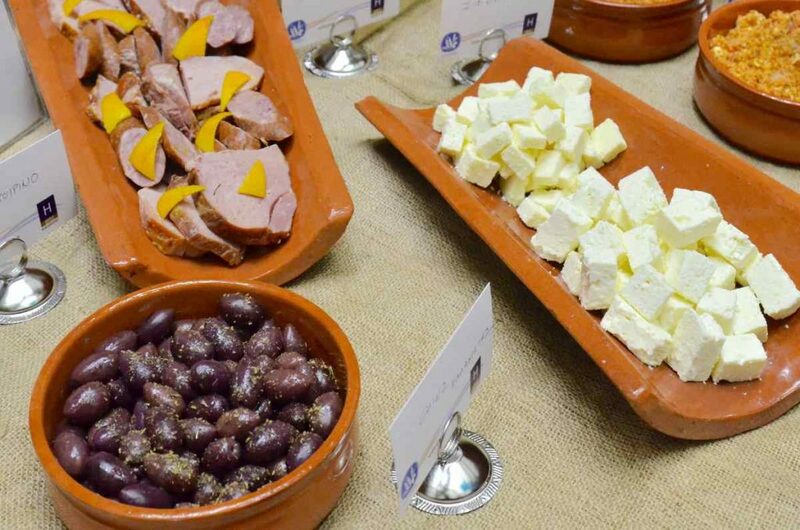 Messinia’s cheeses – graviera, myzithra, feta – produced exclusively from local milk are all excellent, but sfela, a semi-soft, brine-aged cheese, ranks as the best and has earned PDO designation. A new cheese, talangani, similar to halloumi, sfela, formaella and Chios mastelo, is the fairly recent invention of Eleni and Kostas Apostolou at Gargalianoi. It is made with ewes’ milk and has caught on fast in Greece and abroad. Synglino is another word for the famous local cured pork (pasto) of Messinia; it is smoked over a fire made of sage, lentisk and cypress branches and then boiled in orange juice, spiked with cloves, spices and orange peel, before being preserved in olive oil. The honey of Messinia, especially that from the slopes of Taygetos, comes from areas rich in endemic and sweet-smelling plants. It is renowed for its aroma and taste. This sweet, a kind of sesame brittle, is a symbol of abundance and fertility. In antiquity it used to be offered at weddings to ensure that the couple had a prosperous future. Pasteli has been part of the Greek diet for thousands of years and is made in many parts of the country, most notably in Kalamata, where it is one of the area’s prime specialities. Botanical studies have demonstrated that Taygetos is one of the richest and most interesting ecosystems in Europe with a large number of endemic plants and herbs. In antiquity doctors used them for therapeutic purposes, while in our own day, they still form the basis for much pharmacology and are used to make delicious healthful tisanes, while being in demand for their astonishing healing properties. The prickly pear has been around for a long time in Messinia. The spiny cactus was used more as a protective hedge than for its fruit. But lately farmers in the region have been cultivating it and it looks like having a bright future. The ideal climate of Messinia makes it possible for gardeners and farmers to cultivate almost anything with great success and tomatoes, cucumbers, peppers, okra, string beans and watermelons all do well here. But some are unique to the region, such as a special type of aubergine, Maniot artichokes and Messinia potatoes, which are particularly tasty and early to ripen. Their annual production exceeds 35,000 tonnes. The common peanut (arachis hypogae), a favourite snack known to all, also grows in the region of Messinia. The salt gathered from the rocky peninsula of the Mani is a highly prized fleur de sel. Too delicate to be used for cooking, its flaky crystals are more of a condiment, to be sprinkled on food just before eating. Because it has undergone no processing, it contains trace elements of fluoride, magnesium, potassium and calcium and is considered much healthier than ordinary table salt. It’s more expensive since it’s collected by hand. Suckling pig. Spit-roasted suckling pig is one of the most characteristic dishes of Messinia, whose history can be traced to the Ottoman occupation (1460-1821), no doubt adopted to set the Christians apart from their Muslim conquerors. Pork with celery and leeks. 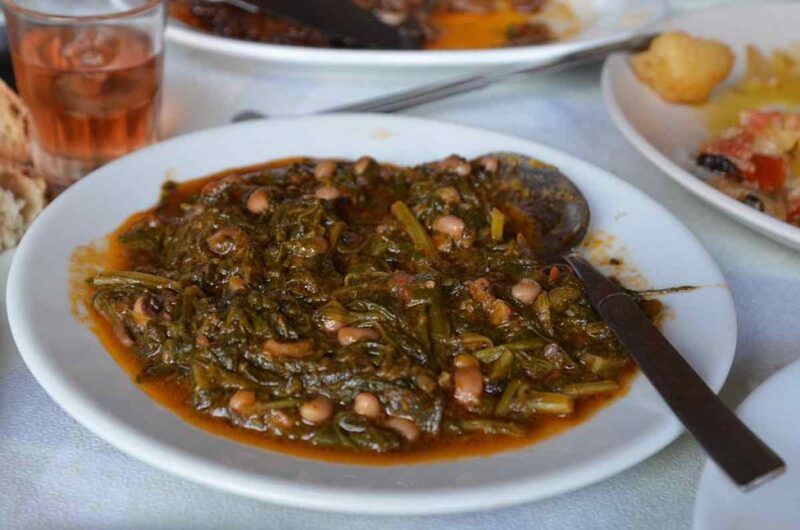 One of the best-loved meat stews of Kalamata. Kayianas. 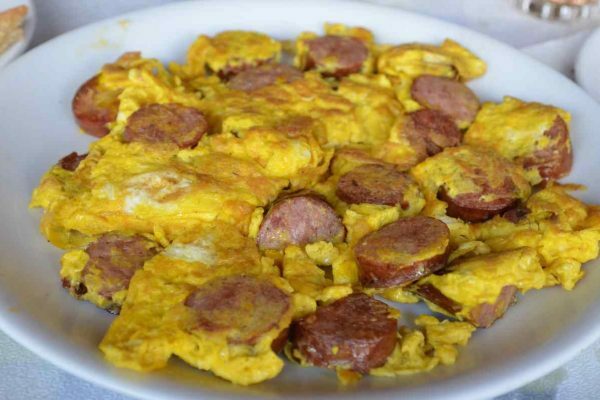 Scrambled eggs with tomatoes and synglino or sausage. The most impressive version of this dish is made with potatoes, synglino and local spring artichokes. Courgette blossoms. Courgette blossoms, with their stamens and pistils removed, are sauteed in olive oil with other fragrant greens and drizzled with grated tomato. When they have simmered for about an hour they are seasoned with salt and pepper and then served. Courgette fritters. Made with grated courgettes, herbs, onion and feta, fried in olive oil. Bakaliaros tsiladia. A traditional dish of fried salt cod simmered in a tomato sauce with onions and currants. Spinach with black-eyed peas. Black-eyed peas, spinach or wild greens, spring onions and herbs (fennel, dill, chervil) cooked with fresh tomatoes and olive oil. Stuffed tomatoes and other vegetables (peppers, courgettes) with rice, spring onions and currants. Oranges with olives and oil. A salad from the Mani with coarsely chopped oranges, black Kalamon olives and olive oil. Messinian salad. 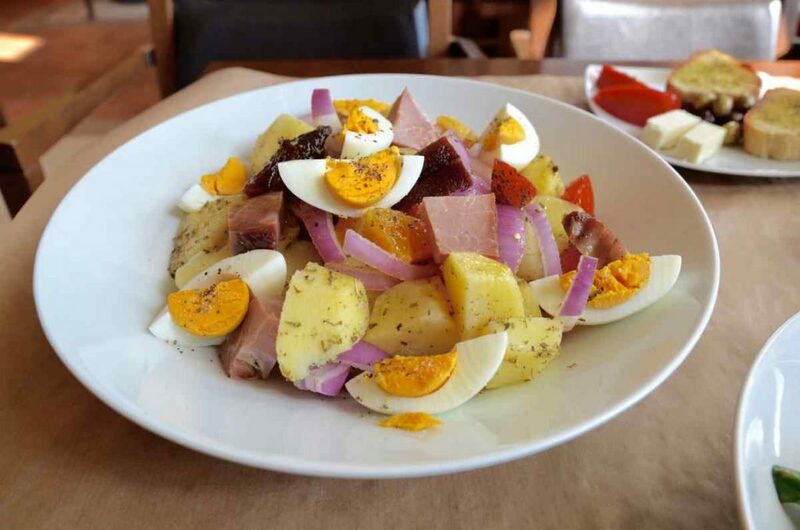 Made from local products, like potatoes, boiled eggs, dried onion, pieces of lalangia (fried dough coils), olives, sliced oranges, sfela cheese, cured pork, dressed with Kalamata olive oil and balsamic vinegar. Cockerel cooked in wine with homemade noodles. 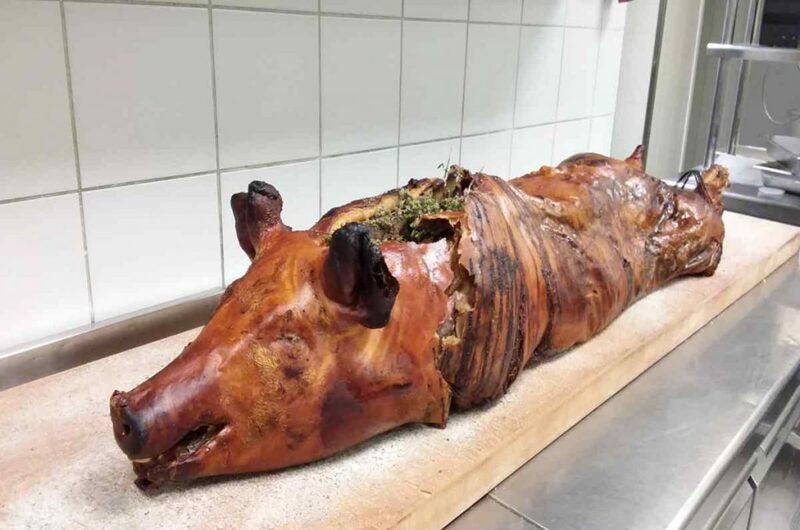 A typical Sunday or holiday dish. Sausages seasoned with orange. A treat beloved among the residents of Messinia. Red mullet savori. A traditional recipe invented centuries ago as a way of preserving fish before refrigerators existed. It has its roots in Byzantine, possibly even Roman times. Cooks would fry a lot of ‘barbounia’, more than they could eat at one sitting, and then in the same oil, toss some garlic, currants and sprigs of rosemary, deglaze the pan with vinegar and petimezi (grape must molasses) and pour the sauce over the remaining fried fish. They would keep for several weeks, stored in a cool place. 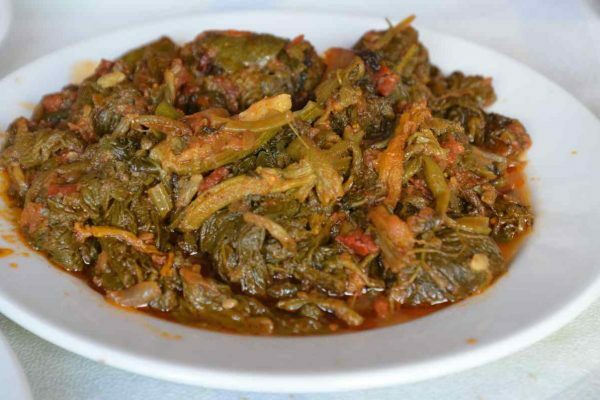 Tsouchti is an amazing dish, totally unexpected and unbelievably delicious, a brilliant example of Messinia’s cucina povera. It consists of thick macaroni, fried in hot oil, mixed with dry myzithra cheese and served with a fried egg, which would provide the essential proteins and make it even tastier. Omatia. Also called goumidia or yematia are a kind of sausage that is prepared with pork intestine stuffed with a mixture of boiled bulgur wheat and finely chopped pork liver that has been sauteed with mountain herbs, spring onions, spices (cloves, allspice and cinnamon) and finely chopped orange peel. Liopita or olive pie. Made with traditional fyllo pastry, Messinian olives and olive oil (from the local koroneiki olive). Diples or ‘folded pastry’. An indispensable accompaniment to joyous events, engagement parties, weddings and christenings, diples are basically very thin sheets or ribbons of dough that are deep fried in oil and drizzled with honey. About as simple as a dessert can be, they symbolise the ‘sweet life’ destined for the newly weds. Lalangia. 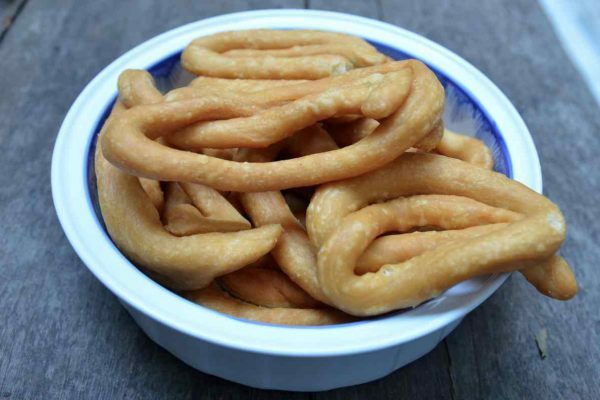 Traditional to the Messinian Mani, these are very thin coils of dough made from the simplest of ingredients – flour, oil, and water – that are then fried in fresh extra virgin olive oil until they are nice and crunchy. They come in various shapes. Traviktes pites or ‘pulled pies’ and other pastries. Pulled pies also called ‘petoules’ and ‘koutalides’ are open pies – a knob of pastry flattened with the hand and then deep fried before being sprinkled with honey or syrup. They usually contain just flour, water, oil, salt and dry yeast. Milk pies and galaktoboureko (custard pie with a crisp fyllo crust glazed with sugar syrup) are local sweets that make use of the abundant milk produced by the area’s shepherds and dairy farms. Watermelon and feta. Whether dessert or a snack in the hot summer, this is a combination guaranteed to produce a smile of utter bliss. Homemade halva with semolina, almonds and currants is a typical dessert at Messinian tavernas, typically offered ‘on the house’. Vyssinada or sour cherry preserve is a refreshing drink, served in a glass of cold water with a spoonful of 4-5 Morello cherries, which have a wonderful sweet/sour taste. The syrup alone is used to make a sour cherry ‘ade’.